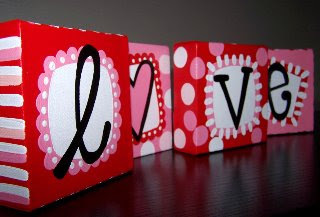 It's time to spread some love around your home. I asked for your Valentine decor photos and you delivered! Thank you! Sit back and get ready to be inspired. 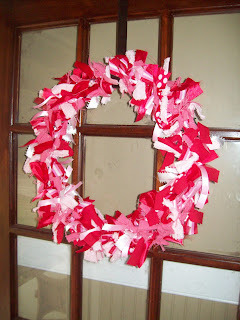 Tiffany sent some quick and easy ideas you can do with vinyl! 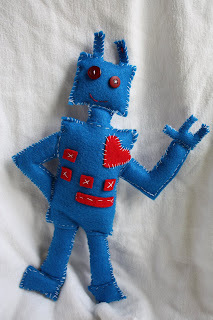 And a cute little robot to snuggle. Think how cute he would be sitting on your couch. Shelley has the coolest banner! This is very original. What talent! Kelly is new to the blogging world, but certainly not new to the creative world. She even has a tutorial on this project below. Janie has a whole loot she's created for this special day. Katie, a kindergarten and special ed teacher sent me this below and she also has a full tutorial for anyone wanting to tackle this by Saturday. Great job Katie! (instead of using it as an advent type........just fill all the pockets full of chocolate!) She also has a cute pillow on her site. Cristin........who has 6 kids.........who was also a past feature.........she swears (well probably not) by just decorating a couple of places in the house to keep it fast and simple. Love her ideas below. Jamie is spending her first year in her new home, so she's excited to decorate! I also noticed she had my "I heart TCB" too! I love her. 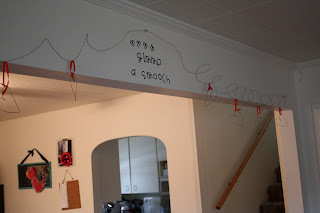 Banners are a great way and pretty simple to add to each holiday! 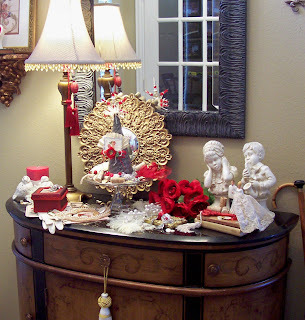 Laurie from Magpie Ethel.......another past feature shares many Valentine vintage goodies. I especially love this wire wreath with vintage cards. You'll get lost in all her talent when you visit her blog. Erin didn't leave me her blog........but she did send some cute conversation blocks. Great idea. Julie sends in her lovely table arrangement. V & Co. sent me her site with a lovely quilt! Click over to see it. I would use this year round, wouldn't you? Thanks Vanessa. Campbells Creations sent in a few photos........I love the banner! Love banners. She also sews cute things on her children's shirts. Thanks! I just love what Bekah sent in...........I may have to do this........I would get to play with fabric without having to sew. Meghan sent me a link to her site for a Valentines Day tree..........Who says tree's are only for Christmas? Thanks Meghan. Gail from Utah (of course......where they all sew) sends me a shot of her quilt. She didn't leave me her site though. So there ya have it! 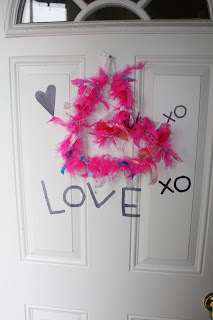 A few ways to bring a bit of love into your home. Thank you to all who took the time to send me photos. I've got some great new ideas! Lots of talented people out there. My camera batteries went out on me and I didn't get any new ones fast enough to get pictures to send in in time...*sigh*. those are great! i sent you several?? i had hoped you got them! Those are some great ideas! 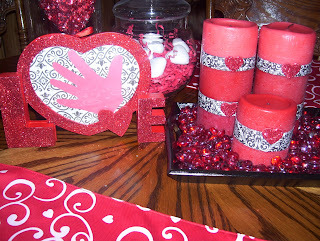 I have been so impressed by the volume of great V-day ideas around blog land! Thanks for putting up my pictures- you are a rockstar! Thank you so much for featuring my Valentine Countdown. I love this blog, Seeing all the great blogs you find on it was one of the main reasons I decided to start my own. I am thrilled to have a project on it; it really means a lot to me! These are fabulous ideas! I really love the heart banner by Shelley, I haven't seen one like that before! Thanks for including my photo! 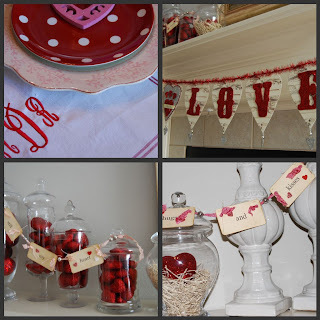 Thanks so much for the nice mention on your post about valentine decor. You are a gem! Have a wonderful valentine's day! i love all the projects! My favorite one is Kellys! so cute! I'm from Utah. I don't sew. I actually break out in hives at just the thought of it. I gotta catalog them in my lil brain! Hope there is enough MB space for these brilliant ideas!